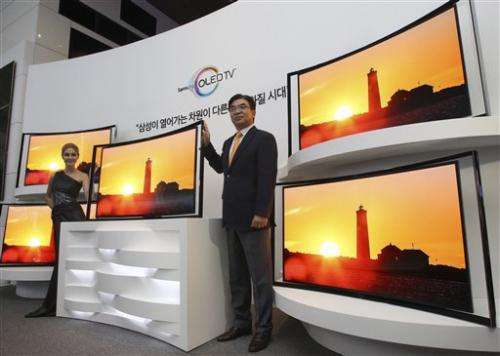 (AP)—After delays, Samsung Electronics Co. rolled out Thursday a curved TV that uses an advanced display called OLED. The 55-inch TV will sell for 15 million won ($13,000) in South Korea, more than five times the cost of LCD televisions of the same size. But Kim Hyunsuk, the executive vice president of Samsung's TV division, said the company is optimistic about demand for the high-end TV. "OLED is about picture quality," Kim told reporters. "We are sure that we realized the perfect picture quality." It remains to be seen if consumers will be willing to pay a premium for enhanced imagery. The TV industry has been struggling to excite interest with its latest technologies. In recent years, attempts to boost sales by introducing 3-D TVs and TVs that are connected to the Internet have failed to end the downturn in the TV industry. 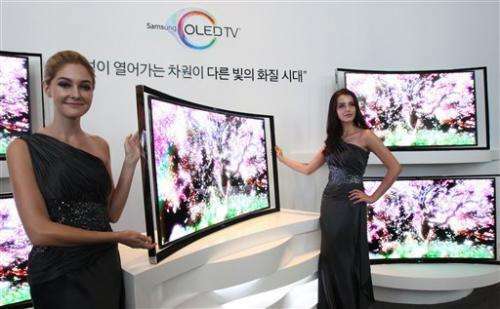 Samsung is not the first to introduce a curved TV using OLED. 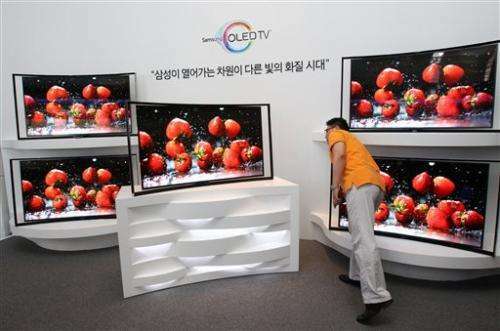 In May, its rival LG Electronics Inc., the second-biggest TV maker, launched a 55-inch curved TV in South Korea. LG's model, which also sells for 15 million won, is not sold outside South Korea. LG spokesman Kenneth Hong said the company will ship curved OLED TVs to other countries in the near future. Samsung will ship its curved OLED TVs to overseas markets starting July, Kim said. The company does not plan to manufacture flat OLED TVs this year, he said. The concave display gives viewers a sense of being immersed in the images, according to Samsung. Samsung and LG, which are the only TV makers in the world to begin commercial sales of OLED TVs, had promised to launch them in 2012 but delayed the launch to this year. The two South Korean TV giants tout OLED, short for organic light-emitting diode, as the next-generation display technology that will eventually replace older displays. But mass producing OLED displays still faces many challenges, leading to high prices. In addition to curved OLED TVs, Samsung launched two ultra-HD TVs, with about four times the resolution of regular high-definition TVs.